Microservice discovery with Spring Boot and Eureka - Don't Panic! 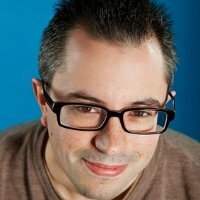 Microservice discovery with Spring Boot and Eureka - Don't Panic! One of the standard problems with Microservices Architecture is the issue of service discovery. Once we’ve decomposed our application into more than a handful of distinct microservices, it becomes difficult for every service to know the address of every other service it depends on. Configuring dependencies from inside a microservice is impractical – it distributes configuration among all the microservices. It also violates the DRY principle – multiple microservice instances will need access to the same configuration settings. What’s more, it goes against the Dependency Injection design that’s supposed to be one of the benefits of the Microservices Architecture. The code for the following example can be downloaded from the Spanners demo app, version 4.4 on GitHub. The full stack exists as Docker images at DockerHub and can be started with this docker-compose file. Spring’s Getting Started with Service Registration and Discovery describes how the same can be managed with Gradle. When this Eureka server starts, it will listen for registrations on port 8761. When our microservices start, they’ll make a call to Eureka to register themselves. 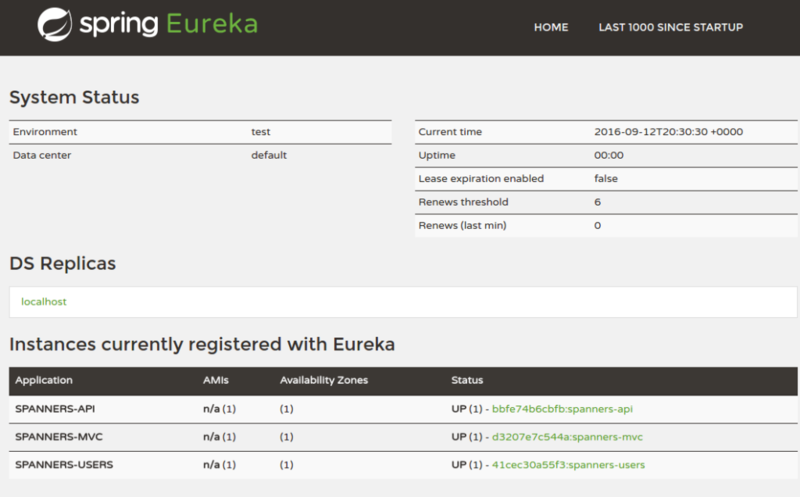 Then they can query Eureka to find other registered servers. 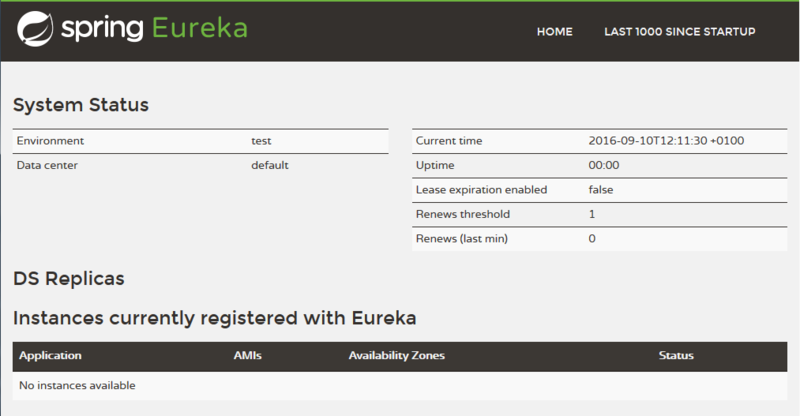 Eureka also provides a simple status console which can be viewed on http://localhost:8761. This console shows that Eureka is running and that no instances are currently registered. This just switches on the Ribbon load balancing behind the @LoadBalanced annotation. If you’re interested, RibbonAutoConfiguration does the customization of the RestTemplate and RibbonClientHttpRequestFactory does the Eureka lookup. This is all done for us, just by adding the @LoadBalanced annotation to a RestTemplate bean. As of Spring Boot 1.4, it’s no longer recommended to directly @Autowire an instance of RestTemplate into a Rest client class. Instead, we can use the RestTemplateBuilder to give us some more flexibility in configuring the RestTemplate. It also allows us to use the new @RestClientTest annotation to test Rest clients. More details on the advantages of the new RestTemplateBuilder in my previous post on the subject. This is pretty much a copy of the RibbonAutoConfiguration.RibbonClientConfig bean used to power the @LoadBalanced annotation except that it configures an instance of RestTemplateCustomizer. The RestTemplateBuilder automatically pulls in all configured RestTemplateCustomizers when it initializes so we don’t need to manually inject this into anything. The conditional annotations on this configuration class create the RestTemplateCustomizer only if Ribbon (and Eureka) is enabled. With this bean present, we can use the RestTemplateBuilder in our Rest client code and it will resolve our application names, just as if we had use the @LoadBalanced annotation. Posted on September 12, 2016 by Stuart Leitch. This entry was posted in Spring Boot and tagged discovery, eureka, microservice, netflix. ribbon, RestTemplateBuilder, spring boot, spring cloud. Bookmark the permalink. Very informative article! Thank you for writing it. Can you provide a source for this recommendation? However, you do go on to mention how instead you can use RestTemplateBuilder. Instead of doing that, why not just do what the spring docs recommend, and do something like this in a @Configuration class? The disadvantage though is that you can’t (yet) just stick a @LoadBalanced annotation on it and expect it to work with Eureka. So if you don’t need to customize your builder and are happy to test without the nice @RestClientTest stuff introduced in Spring Boot 1.4, you are indeed best sticking with a simple @LoadBalanced RestTemplate. I am new to this microservices and eureka configuration. Can you please help me by sharing some sample code or link from where i can get understanding reference for creating structure with spring boot and eureka without docker. As even i am newer to docker. But for now as per the requirement i need to create a structure with spring boot fusing microservices and eureka. Please help me.It would be really great if you give some solution. So glad to hear you’re looking at Microservices and Eureka! The sample code at Spanners Demo App, version 4.4 was built with Docker but should work just fine without it. Alternatively, I found the Getting Started guide at Spring.io very helpful. Finally, I found Josh Long’s Cloud Native Java presentation from SpringOne Platform 2016 excellent. It’s worth watching the whole thing but he talks about Eureka specifically from around 33:00. I have one question. When we have more than one Eureka server instance running for scalability and failover reasons, how will the client make a lookup to the Eureka via the Resttemplate. Since there are more than one Eureka Server instances how does the client decide which one. Does Ribbon does the load balancing for that too similar to the way it does for target service being consumed? 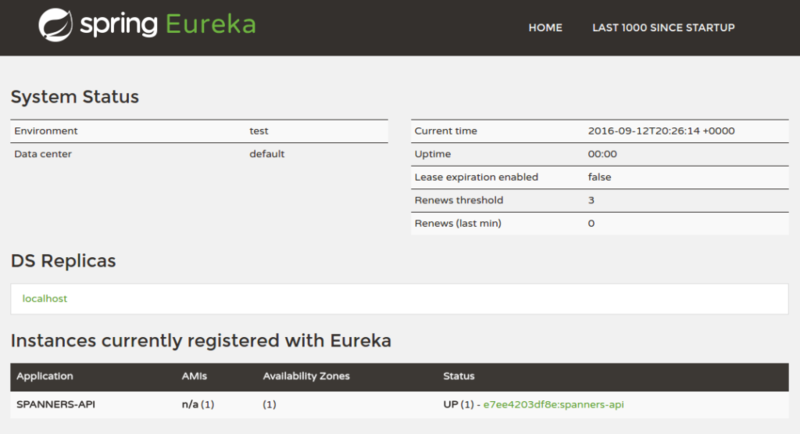 Is there any way to hide or restrict the Eureka server status page to outside world ? I would expect that you’d want to protect your Eureka server at the network / firewall level. If you’re on a traditional LAN, you’d put it on an internal (not internet facing) server. If you’re in a cloud infrastructure such as AWS, you’d put it on an internal security group. If you need this to be on a server exposed to the outside world, you may be able to use Spring Security to restrict access. If you’re using Spring Boot, add the spring-boot-starter-security starter and you can then use all the Spring Security features. You could restrict the status page using a simple username / password or you could restrict by other means – for example by IP address. If i want to do Integration Testing of The Controller present in your Account-Service using @SpringBootTest ,then is there is need of registration of Account-Service to Discovery Server for Integration Testing ? ?